It was an age of mighty heroes, misunderstood monsters, and complex villains. With the publication, in November 1961 of Fantastic Four #1, comics giant Marvel inaugurated a transformative era in pop culture. Through the next two decades, the iconic Hulk, Spider-Man, Iron Man,and the X-Men leapt, darted, and towered through its pages. 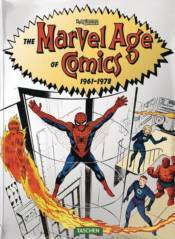 The Marvel Age of Comics 1961-1978 takes you to the heart of this seminal segment in comic history, an age of triumphant character and narrative innovation that reinvented the super hero genre. With hundreds of images and insider insights, the book traces the birth of champions who were at once epic in their powers and adversaries and grounded in a world that readers recognized as close to their own; relatable heroes with the same problems, struggles, and shortcomings as everyone else.